Survivor: Borneo was the first season of the American reality show Survivor. When it was first being shown, it was simply called Survivor but its official name has been changed to Survivor: Borneo, so viewers can tell which season they are watching. Before the change to Survivor: Borneo, the season was known as Survivor: Pulau Tiga, but it was changed again to its current name so viewers would not get this season confused with the tenth season, Survivor: Palau. The show began filming on March 31, 2000 and ended on April 20, 2000. It was shown later that year on CBS. It was set in the South China Sea on the Malaysian island of Pulau Tiga in the state of Sabah, about 6 miles (9.7 km) off the north coast of Borneo, Malaysia. The show became available on DVD on May 11, 2004. At the beginning, the sixteen players were divided into two tribes, an orange tribe, Tagi, and a yellow tribe, Pagong, which the producers named after their beaches. When ten players were left, the two tribes merged, becoming one tribe. Players Sean Keniff and Jenna Lewis named the new tribe "Rattana". After 39 days of playing, Richard Hatch was named the Sole Survivor, winning against Kelly Wiglesworth in a 4–3 jury vote. In 2006, it was revealed that Hatch did not declare his winnings, among other earnings, in his tax return and was sentenced to 51 months in prison. The Survivor: Borneo finale (last episode) got the highest ratings of any Survivor episode to date. Richard Hatch, Jenna Lewis, Rudy Boesch, Susan Hawk and Colleen Haskell were asked to return in the eighth season of Survivor, Survivor: All-Stars. Haskell was the only one who did not return, while Hatch, Lewis, Boesch and Hawk placed 14th, 3rd, 17th and 13th. The game had sixteen players, divided into two tribes, Pagong and Tagi. After six players were voted off, the tribes were combined, or merged, to make one tribe, Rattana. Seven players made up the jury, who chose who would win the game, and the $1 million prize. Jenna Lewis came in eighth place and was the second jury member. 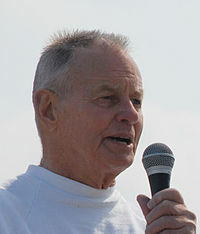 Rudy Boesch came in third place and was the seventh jury member. A The Total Votes is the number of votes a player got during Tribal Councils where the player is able to be voted out of the game. It does not count the votes they got during the final Tribal Council. B If more than one tribe or player wins reward or immunity, they are listed in order of finish, or alphabetically if it was teamwork, or if one player won and invited others, the players they invited are in brackets. C The first challenge was a combined reward/immunity challenge. The winning team got immunity and waterproof matches. D Sometime between day four and six, a reward challenge took place that was not shown on TV. The challenge involved holding weight on poles. Richard held the weight for Tagi, as Joel for Pagong. The reward was a map to a closer water hole. E The final four vote was tied with Richard and Sue each getting two votes. In the tie-breaker vote, Rudy voted for Sue again while Kelly changed her vote from Richard to Sue. F There was no reward challenge because of the tribal merge. G Richard and Susan were not able to vote in the second Tribal Council vote. "Survivor: Borneo contestants (Archived copy)". CBS.com. Retrieved 2007-06-21. ↑ "Richard Hatch Sentenced to 51 Months". The Smoking Gun. 2006-05-16. ↑ "Variety: 'Survivor' Finale Racks Up Phenomenal Ratings". Variety. 2000-08-25. ↑ Porter, Rick (2004-01-20). "Burnett Wasted Little Time Finding 'Survivor' Stars". Zap2it. Retrieved 2008-11-11. ↑ 5.0 5.1 ""Survivor" (2000) — Episode list". IMDB. Retrieved 2008-11-25. This page was last changed on 12 March 2019, at 13:10.